Parmesan cheese and Balsamic vinegar, ham and salami tour with our delicious farmer’s brunch at an organic Lambrusco producer. The Farmer’s Brunch can be booked as part of the Foodie’s Delight tour. This is one of our most popular tours that enables you to visit the best of Modena in one day: Parmigiano Reggiano, Traditional Balsamic vinegar and Organic Lambrusco. This is not an ordinary winery but organic farms that also grows heirloom wheat and bottles of wine only with the traditional champenoise method. 1) Parmesan (Parmigiano Reggiano) factory visit with full production. After the pick up from your hotel or meeting the guide at the designated point, you will be taken to a PDO Parmesan cheese dairy in Modena. Emilia Delizia will assign you a professional gourmet guide for the day you will be literally inches away from the cheese making. The guide will explain step by step how this famous product is made, at this point you will see how the milk is coagulated and the cheese curds are lifted and inserted into the moulds. The detailed guided tour will also include the brine stage and the ageing cellars. Of course, you will taste different ageing of the cheese in order to understand how the product changes with time. 2) Traditional Balsamic Vinegar producer visit in Modena. We do not visit “balsamic vinegar factories” but rather small traditional vinegar producers in Modena. The black gold of Modena is made at home, and we will take our visitors directly to the producer’s home. Here you will walk between the barrels stored in the house attic as the tradition dictates. Emilia Delizia’s expert guides will take care of explaining in detail each step of the production. It is worth to mention that this product is aged for a minimum of 12 and up to 25 years. This surprises to many visitors who are more accustomed to cheaper versions of the famous vinegar. At the end of our visit, we will sit around the family table and have our tasting. Few drops of the nectar are sufficient to enhance our dishes and during the tasting stage, we will learn how to match each vinegar with food. 3) Ham and Salami tour with generous tasting. As Part of this tour, we will take you to the Villani ham and Salami factory for a tour of Musa the first charcuterie museum in the world. Here you can learn how Parma ham, Prosciutto di San Daniele, mortadella and many other Italian salamis are made. For more information please check this page. 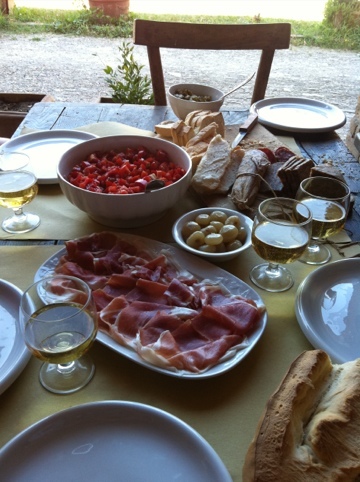 Lambrusco winery and Organic Farmer lunch – Our best rustic experience. Our last stop will be at an agriturismo where we will explore the beauty of organic farming. Our partner produces classic method Lambrusco wine, heirloom varieties of wheat, organic forgotten vegetables and fruits. After a detailed walking visit of the farm, you will be sitting around the rustic table to enjoy the famous farmer brunch. The lunch consists of many specialities of the area such as hand carved ham, ciccioli (cooked and pressed bacon) fresh and aged cheese with the unforgettable Salsa Luisa, all served with the farm made sourdough focaccia bread. 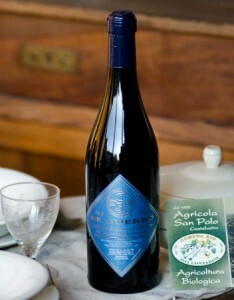 The lunch will be accompanied with the farm classic method organic wines such as Lambrusco and Trebbiano. Cooking with us at the organic farm. In 2013, we started to offer pasta cooking classes at the organic farm. It was an immediate success. Our guests learnt the process of organic farming and picked herbs, vegetables and fruits directly from the field. Then we went to the kitchen and we started to prepare fresh egg pasta with organic red wheat flour that is also produced at the farm. The classes are always hands on, so the participants actually prepare the dishes under the chef supervision. Time permitting we always try to prepare a full course meal, pasta, meat or vegetarian second course and a simple dessert. Most of the recipes are from the Italian farmer’s tradition. Advantages of the 3 gourmet food tours from Bologna/Modena. A real chance to see 3 gourmet producers and an organic farm to sample real products straight from the land. This tour includes unique sparkling wines that you will only find in Modena and Bologna. Shorter transfer times than other tours, with less time spent in the car and more time spent enjoying the food, the landscape and our beautiful farm. Panoramic tour in the countryside and around Modena and Castelvetro, with the possibility to stop at medieval castles of Vignola, Castelvetro and Levizzano. Possibility to add a stop at the Ferrari factory in Maranello. Learn about ancient wheat and lost vegetable varieties. Possibility to purchase products at each stop and bring home gourmet souvenirs. Stay at the Organic Farm. It is also possible to stay at our farm please see some of the pictures of the rooms available. Thank you for getting in touch, I have emailed a quote as per your request. Seeking info on the tour of Parmesian cheese and balsamic production. One or maybe two persons. I realize this is short notice but we will be in the area of Modena on Wednesday, May 22 or Monday May 27. Please provide cost and schedule.